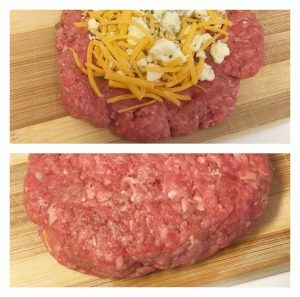 You and your guests will fall in love with these perfectly seasoned hamburger patties that have been stuffed with a delightful tangy blue cheese/cheddar cheese mixture. 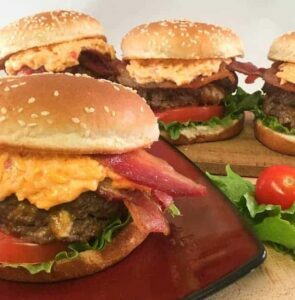 After cooking, top the patties with zesty pimento cheese and crispy cooked bacon. 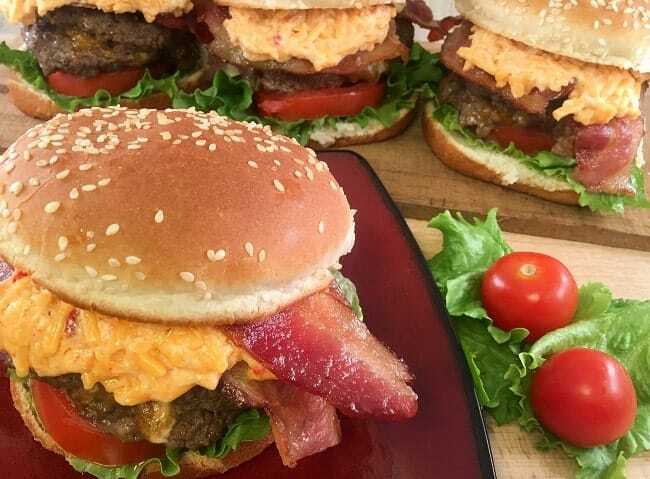 The pimento cheese will slowly start to melt over the hot hamburger patty. Add sliced tomato and lettuce for the final touches. In my opinion, these are so good that you don’t need to add any additional seasonings or condiments. Hamburger eye candy, people. Use a good quality hamburger meat that’s slightly fatty such as an 80/20 ground chuck. For best results, use grass fed beef. Ever since we discovered the higher quality, better taste, and tenderness of grass fed beef, we are hooked. FarmFoodsMarket offers grass fed beef at reasonable prices. Plus you get to pick the farm where your beef comes from. How neat is that! We visit our farmer’s market on Saturdays and pick out local, grass fed beef. I love going to the farmer’s market and getting to talk with the farmers who have raised the cows, grown the vegetables, and the chickens that have laid the cage free eggs. I appreciate the farmers so much. 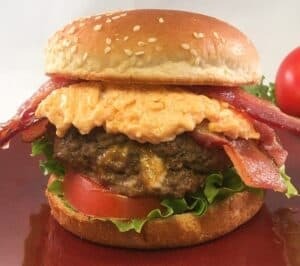 If you’ve never tried pimento cheese on your hamburger, then don’t hesitate any longer! I can assure you, you won’t be disappointed. Just be sure to purchase a good, high-quality pimento cheese (one that’s made with real cheddar cheese and not the processed kind). 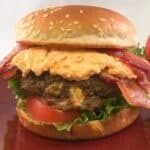 If you have the time, you could make your own pimento cheese as there are many great recipes available on the intranet. You’ll want to make these burgers time and time again for family get-togethers, tailgating with friends, and date nights with your better half. For some additional ideas for a date night, check out our post 8 Inexpensive Date Ideas to Build Your Relationship. Here’s what an uncooked patty with the blue cheese mixture looks like. Pretty easy. Note that the mixture doesn’t go all the way to the ends of the “bottom” patty. You’ll need to press the edges together with the “top” patty to form a seal so all that cheese won’t come out while cooking (note the patty with edges sealed). And now for the finished product! The ULTIMATE blue cheese stuffed hamburgers. Serve with or without a bun; delicious either way. I ate mine on a bun and my husband ate his without the bun. Combine the ground beef with the dijon mustard, worcestershire sauce, minced garlic and black pepper. Divide equally into 8 balls. Press each ball to about 1/4" thickness . Combine the blue cheese, cheddar cheese, and parsley flakes. Mound equally on top of 4 patties. Top with remaining 4 patties pressing edges together to create a seal. Heat the oil in large skillet on medium-high heat. Cook the patties about 4 minutes, then gently turn over and cook an additional 4-5 minutes or until burgers are no longer pink. Remove from heat and top each patty with 2 TBSP pimento cheese. Serve on hamburger bun with lettuce & tomato, if desired.